I saw this tutorial online several months ago and knew that I had to make some of these cute paper roses! These are a perfect way to utilize your leftover scraps in your paper stash. 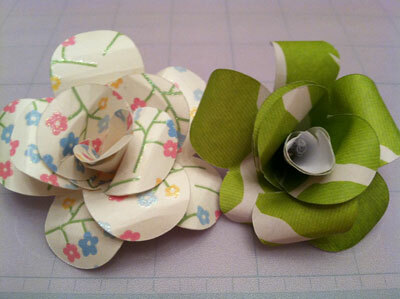 Rather than reinventing the wheel, I’m going to send you to this amazing video tutorial to make these paper roses. I used my Cricut machine and the George and Basic Shapes Cartridge. You use the 5 petal flower that is on the cartridge, the blackout/shadow option and have to remember to select shift before you push the flower button so that you can choose the 5 petal flower instead of 6 petal one. I cut these to be 2 1/2 inches, however depending on what you are using them for, you can cut them much larger. Some of the ideas I had for these flowers are to decorate gift packages, to use in bouquets for weddings or centerpieces around the house. You can add glitter or distress ink to the edges and really make them shine and sparkle. What are some ideas you have for these flowers?